Angry Birds VR - but will we get chance to play it? Did you enjoy playing Angry Birds on your smartphone back in 2009? Would you like to relive the experience in a huge virtual world? 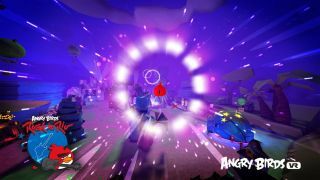 You might be in luck as Rovio has just unveiled a VR version of its best-known title. Angry Birds VR was demoed last weekend at the Rock in Rio festival in Las Vegas. The game uses a Samsung Gear VR and can apparently be controlled by the volume of the surrounding crowd. Details of the experience are thin on the ground but a tweet from one of the game's developers places players right in the middle of the action, presumably thudding against pigs, blocks and pillars in a virtual sense. Before we all get too carried away with ourselves, Rovio's official press release says the VR version was created "exclusively" for VIP guests at the festival so it's not certain that the masses will ever get their hands on it. However, if it proves a hit, it would be difficult for Rovio to resist releasing the game across the many VR headsets heading to the market. The company has bled every other Angry Birds avenue dry after all. We'll have to wait and see what Rovio does but the dawn of the next virtual reality age could see all kinds of classic titles dusted off and given a new lease of life - Flappy Bird, VR edition anyone? Check out the best games to play on your Android phone.